This year, Fairtrade Fortnight takes place from 29 February to 13 March and we will be encouraging our customers to support the cause. 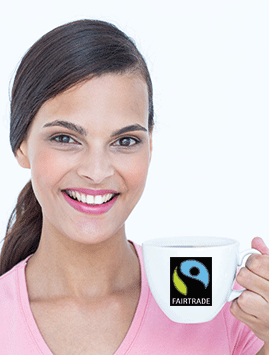 Fairtrade products are better for producers and the environment because sustainable practices are actively encouraged. Fairtrade-certified products are free from GM ingredients and the use of pesticides and fertilisers are limited and discouraged. Producers and workers are guaranteed safe working conditions and sustainable wages – all things which are taken for granted but are often at the bottom of the priority list within intensive farming practices. Through buying Fairtrade products, our customers are guaranteed a better taste experience compared to food which has come from intensive mass farming and is the product of mass processing. By purchasing Fairtrade products they are supporting a better environment, better working conditions and improved livelihoods for farmers and their workers, therefore helping to promote and preserve more sustainable environmental and human practices which will benefit generations of people to come. The cost of Fairtrade products may be slightly higher than their conventional counterparts but the difference in quality and taste is markedly different and so it is worth spending a few extra pennies. Ethics are extremely important to us as a retailer; we have a responsibility as a health food store to ensure the products we sell are doing some good for all those concerned, from supplier to consumer. We try to carry as many Fairtrade/fairly traded products as we can and will choose those over the alternative when it comes to choosing whether or not to stock a product. The types of Fairtrade products we stock include teas and coffees, chocolates, dried fruits, sugar, rice cakes, vanilla extract and coconut flour. The brands we stock include Clipper, Cavalier, Biofair, Divine Chocolate, Dragonfly Tea, Equal Exchange, Essential Trading, Kallo, The Raw Chocolate Co., Seed and Bean, Steenbergs, Tiana and Tropical Wholefoods. Fairtrade Fortnight is an ideal time to try out a Fairtrade version of one of your favourite staples or vices – whether that be coffee, tea or chocolate – and see if you can taste the difference. Why not try it for a month and see if you miss your usual brand? Or you could replace one non Fairtrade item in your shopping basket for a Fairtrade one every week for a month. Simple changes like this can help to support a good cause which benefits farmers, producers and the environment. 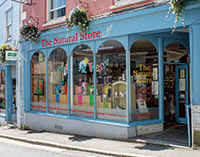 The Natural Store is part of a long tradition of Cornish whole food stores. It is part of a trio of shops with the other two branches being based in Helston and St Austell. The Falmouth Store was established in the late 1970s as The Granary and was reinvented over the years as Harvest, Four Seasons and Wild Walnut. It was renamed The Natural Store in 1997 and has remained so ever since.